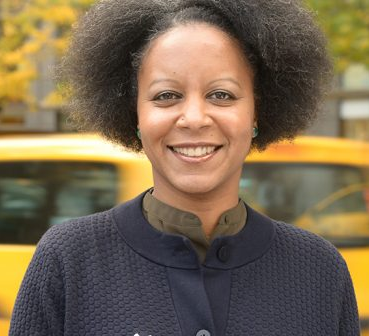 Dr. Christina Greer of Fordham University joined the show to discuss how President Barack Obama did, or didn't, live up to expectations, and how his presidency fits into the larger dynamics of race and politics. Barack Obama may have given his farewell address, but he still has work to do. In his speech, the president rightly celebrated America’s history of welcoming immigrants and their contributions to our country. But Mr. Obama’s legacy on immigration is mixed. He has both deported more people than any prior president and acted in America’s best traditions by letting the Dreamers - undocumented youth brought to the United States as children – emerge from the shadows. There is one final step that President Obama can, and should, take to cement his legacy on the side of history we know is in his heart. Most immigrant families in the United States are mixed status, meaning most have children who are citizens and immigrant parents, including Legal Permanent Residents (LPRs). The incoming administration’s promise to deport 2-3 million people with legal infractions threatens to rip these American families apart, because the threshold for deporting legal permanent residents is so low. Experts argue that this 2-3 million number cannot be reached without deporting people for minor offenses, such as traffic tickets. This is why I recently joined 60 local elected officials from across the country in asking President Obama to grant a blanket pardon to legal immigrants who have minor infractions and pose no threat to the country. He can prevent the breakup of these American families. Pardoning this group of immigrants fits with the president’s recent actions on criminal justice and immigration. His clemency initiative and Deferred Arrival for Childhood Arrivals (DACA) program seek to fix the broken criminal justice and immigrant systems that harm American families. Having already designated Legal Permanent Residents with minor convictions as low priorities for deportation, President Obama could protect these American families further with a presidential pardon. Some will object, arguing that America is a country of law and order. We agree, and support the deportation of those posing a risk to our community. We also support the American belief that punishment should fit the crime. Someone who had a minor infraction such as shoplifting or excessive traffic violations as a teenager could be eligible for deportation 20 years later as a responsible adult with children who are citizens. These deportations make no sense, and hurt families and children without enhancing the wellbeing of the country. The group making this request, Local Progress, is composed of local elected officials that know, work with, live in, represent, and are part immigrant communities. We know that deportations cripple families and harm neighborhoods and the economy. We also know that the American Dream lives in our communities and that the country benefits from these newcomers and their children. Pardoning this group would prevent the unnecessary breakup of our American families, and allow parents to stay where they belong, raising their children in the communities they have helped build. Watching President Obama’s farewell speech, I could not help but think about the many families in my Brooklyn district that have lost a family member to deportation. The effects are harsh. When a father gets deported, the family loses income and can lose their apartment. The education of children can be disrupted, and those remaining long to be with their missing family member. For the children – citizens, immigrants, or both – it is a hurt that does not go away. It is a step the U.S. government should not take lightly, or for symbolic political reasons. I stand with my fellow elected officials to ask President Obama to grant these pardons. I also call on my fellow New Yorkers to call the president’s office and tell him to grant clemency to the hundreds of thousands of immigrants who stand to lose under President Trump. Before he leaves office, President Obama can help cement his legacy with such a pardon. He has the power, and should use it, as other presidents have done in the past. There is still time. 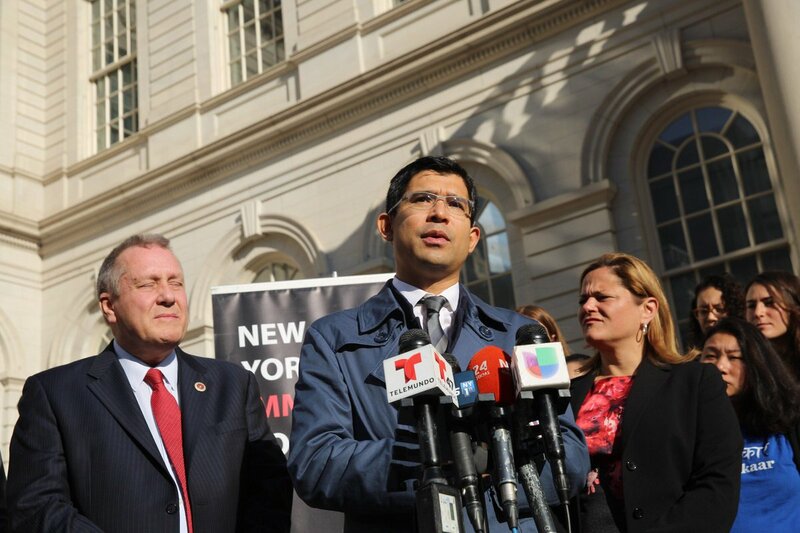 Carlos Menchaca is a New York City Council Member and Chair of the Council’s Immigration Committee. On Twitter @cmenchaca. 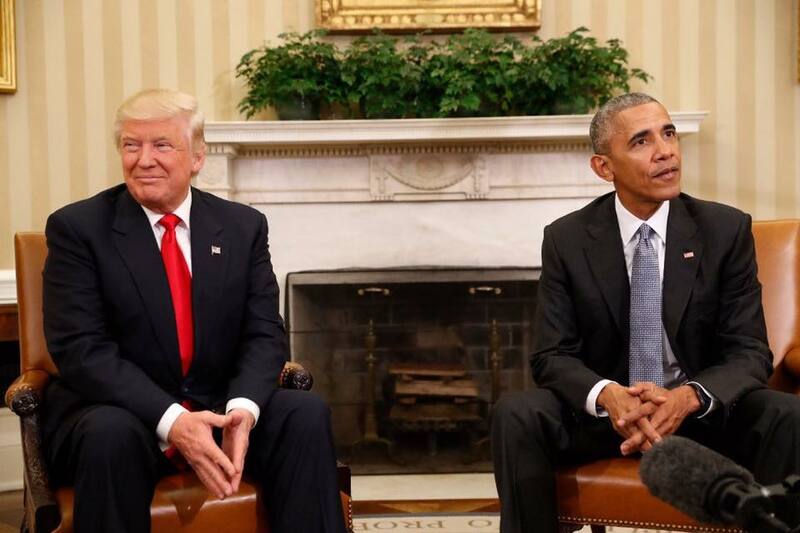 President-elect Donald Trump visited The White House Thursday to discuss transition planning with President Barack Obama. While the election was just decided and it was Trump’s first public move in shifting from the campaign toward governing, the transition process has been underway for months -- both in the Trump campaign and the Obama administration. The period from Election Day to Inauguration Day, January 20, is brief -- just 73 days this year -- and the next President must be able to move quickly during the transition period in order to smoothly take the reigns of the country’s vast government and military apparatuses. Unlike the ideological and, to some extent, personnel continuity that a Hillary Clinton win may have afforded, the Obama to Trump transition will be drastic. But, there are protocols and practices in place, mandated by law and not, meant to make for a successful presidential transition. On both Wednesday and Thursday, President Obama sought to assure the country that his administration is doing everything it can to ensure a smooth transition of power, despite the differences between the president and his successor, whom Obama has called uniquely unfit for the position. Obama reiterated the point on Thursday when he and Trump sat in the Oval Office, with the president saying that his team must do its best to make Trump successful, because if the president is successful, so is the country. The task for Trump and his top advisors, including post-election transition chair and Vice President-elect Mike Pence, is immense -- many thousands of positions to fill, a daunting amount of information to absorb, and important policy and protocol decisions to make. President-elect Trump is under the microscope perhaps to a greater extent than others in his position might be because he heads to the presidency as the first in United States history with no prior government or military experience. Trump immediately set off alarm bells when his first two appointments included Steve Bannon, who has a history of anti-Semitic, white nationalist, and misogynistic behavior, as his top strategic advisor. While all of Trump’s top cabinet posts will be deeply scrutinized, as they would with any president-elect, there is also the vast bureaucracy of both the White House and, to a larger degree, the federal government, that must be filled and managed. A sound presidential transition relies on the preparation and attitude of the outgoing administration, the organization and execution of the incoming administration, and the laws in place to aid in the effort. Prior to September 11, 2001, a few laws were already in place to govern the transition process, and others have been added since. In 1963, recognizing the need for a formalized transition process in the face of a more technologically advanced and rapidly moving world, Congress enacted The Presidential Transitions Act of 1963, which set the precedent for transition funding, allocating $900,000 of federal funds per team. The 1988 Presidential Transitions Effectiveness Act increased funding, capped outside contributions to transition teams, and required that major donations be disclosed. Similar legislation, passed in 1998 and 2000, shortened Senate confirmation periods and addressed the digitalization of government records, but other than that, the scale and schedule of a transition was up to the two administrations. "The national interest requires that such transitions in the office of President be accomplished so as to assure continuity in the faithful execution of the laws and in the conduct of the affairs of the Federal Government, both domestic and foreign,” reads the Presidential Transition Act of 1963. “Any disruption occasioned by the transfer of the executive power could produce results detrimental to the safety and well-being of the United States and its people." After the terrorist attacks of September 11, 2001, the transition period was identified as one of national vulnerability. This led to the 2004 Intelligence Reform and Terrorism Prevention Act. Comprehensive security briefings for incoming high-level personnel became mandated, as was extensive contingency planning, crisis management training, and background checks. Under Obama, further attention was paid to transitions. In March of this year, he signed into law the 2015 Presidential Transitions Improvement Act, which requires the executive branch to establish two transition panels, one for the White House operation and one to oversee the process throughout federal agencies. The panels must be formed six months before the general election. Prior to that, the 2010 Pre-Election Presidential Act required the General Services Administration to provide each major party candidate’s transition team with office space, desks, computers, and phones within three business days of the candidate’s nomination for president. With these laws in place, the Trump transition team has a lot of resources, but also a lot of work to do. According to the president-elect’s transition website, the team is setting up Agency Review Teams for each federal agency, and has begun the vetting and hiring process for the approximately 4,100 presidential appointees. As reported by Politico in October, the Chris Christie-led pre-election transition team had compiled a list of 400 appointees to push through Senate confirmation after the election. Though few other details were made available by the Christie team, Politico also reported that the Trump operation was holding private explanatory meetings for big donors and financial services leaders. One such “look inside” charged $5,000 per person. Shortly after winning the election, Trump announced that Vice President-elect Pence would replace Gov. Christie as the chair of the transition, and also named a larger transition committee. Top cabinet positions are expected to be filled soon, and other high-profile positions will also have to be determined. The policy focus, political orientation, government experience, and demographic diversity -- racial, gender, religious, and more -- of top-level appointments to key administration posts will give an indication of what type of presidency is being planned. The team that will be overseeing this work, Trump’s Presidential Transition Executive Committee, has just been announced. Under Pence’s leadership, committee vice chairs are Rudy Giuliani, Newt Gingrich, Dr. Ben Carson, Christie, Senator Jeff Sessions, and retired Lieutenant General Michael Flynn. The committee will also include Rep. Marsha Blackburn, Florida Attorney General Pam Bondi, Rep. Chris Collins, Tom Marino, Lou Barletta, and Devin Nunes, Rebekah Mercer, Steven Mnuchin, Anthony Scaramucci, Peter Thiel, Trump’s children Donald Jr., Eric, and Ivanka, Ivanka’s husband, Jared Kushner, Reince Priebus, who was RNC chair and has been named Trump’s White House chief of staff, and Bannon, who was the campaign CEO for the home stretch after having led Breitbart News. Rumors have started to fly about possible appointments for different cabinet positions, including some of the names from the transition team. Along with the Bannon hire, there are other red flags being raised about the Trump transition, including the effects of the shift from the Christie-led team to the Pence-led team. On Tuesday, the New York Times reported that “President-elect Donald J. Trump’s transition operation plunged into disarray,” citing the resignation of key transition figures from the Christie team who had been integral to the process and a hold-up around Pence signing essential transition paperwork. Smart, proactive transitions are the first step toward an effective presidency and begin long before the formal transition process that takes place between Election Day and Inauguration Day. Prepared candidates will often begin transition planning before the conclusion of their primary race, will have transition staffs in the hundreds, and can be expected to provide lists of presidential appointees as soon as they can be called president-elect. In 2008, the Obama transition operation consisted of 679 staffers and volunteers, and began before Obama had defeated Hillary Clinton in the Democratic primary. Well-run transitions are important for several reasons. First, national security concerns necessitate a smooth handoff, a process that requires vetting and apprising new defense and high-level personnel well before they succeed their predecessors. The next-in-line officials must be brought up to speed on a wide variety of threats and operations. The President-elect is immediately briefed on the same information as the President. Transitions are seen as a weak point in national security regardless of the quality of the transition, so it is expected that incoming and outgoing administrations will be as diligent and cooperative as possible. Ever since Harry Truman learned of the Manhattan Project a month into his presidency (which was not even by election, but by Franklin D. Roosevelt’s death while in office), national security has been a foremost transition priority. Still, the events of September 11, 2001 dramatically increased the level of attention paid to national security generally and in transitioning. In the 2004 Intelligence Reform and Terrorism Prevention Act, comprehensive security briefings for incoming high-level personnel were mandated, as well as extensive contingency planning. Second, it is in the political interests of both incoming and outgoing administrations to oversee a smooth transition. From the outgoing perspective, it is politically expedient for a president’s reputation to include a well-executed departure from office. From the incoming perspective, a president’s early success hinges on his or her preparedness to take office. “President Bush was very gracious to us during the transition,” President Obama’s former advisor David Axelrod recently told the New York Times, echoing a point Axelrod has stressed publicly in a variety of forums over the years. Preparedness includes having appointees for all high-level positions ready for Senate confirmation, a working policy agenda ready to implement, and a set of priorities to follow. If appointees are not ready, then the confirmation process cannot commence, and agencies take longer to fully assemble. While the 2008-09 transition is heralded as the most successful in U.S. history, there were still hiccups, especially given the surrounding circumstances: a global financial crisis. Because it was such a success, the Bush-Obama transition essentially serves as a template for the successful modern transition -- and it’s one that Obama has said his administration is working to repeat. Two hallmarks stand out when analyzing that transition: early and proactive planning from both sides; and dedication to conquering partisan concerns for the greater good of the country’s security. In “The 2008-2009 Presidential Transitions Through the Voices of Its Participants,” Martha Joynt Kumar, a professor of political science at Towson University, provides a retelling of the transition based on interviews with several important players. Recognizing the biggest obstacle to a fast and seamless transition to be the Senate confirmation process, the Bush administration set about reducing the length of FBI investigations into presidential appointees from 60 to 30 days. It also tasked the Office of Personnel Management (OPM) with performing investigations, so as to have more hands on deck. Though successful in making these reforms, the administration’s attempt to eliminate Senate confirmations for non-policymaking positions failed, Kumar explains. Regardless, it succeeded in streamlining the Senate confirmation process for the Obama administration. Kumar outlines how the Bush Administration focused further still on personnel turnover, requiring that the transition teams from each federal agency collaborate to create a list of 150 crucial positions that needed to be filled as soon as possible. The list was then handed over to the Obama team after the election. As mandated by the 2004 Intelligence Reform and Terrorism Prevention Act, the Bush administration began holding one-on-one meetings with the incoming Obama team as early as Election Day, Kumar explains. Incoming cabinet officers and agency heads sat down with their predecessors to go over contingency planning for each sector of government. By December 4, 2008, the core national security teams from the president and the president-elect had met several times, discussed the administration’s operations in Afghanistan and the Middle East, and had handed over most contingency and crisis planning. The Bush team, Kumar writes, also made it a priority to leave behind a record of their work and experience to help guide their successors. Led by Steve Hadley, the National Security Advisor, the Bush White House compiled a total of 40 memoranda, divided into two sets; one addressing national security and foreign policy, and the other domestic policy. The memoranda contained difficulties that the Bush administration had faced, advice for avoiding such issues, information about particular countries of interest, and an account of all the interactions that had taken place between the U.S. and countries of interest. To ensure that “midnight regulations” -- legislation passed in the last months of a presidency and which, intentionally or not, often burdens the incoming administration with tougher regulations and policy changes they oppose -- did not waylay the new Obama administration, Joshua Bolten, the Bush Chief of Staff at the time, declared that proposed regulations had to be submitted no later than June 1, 2008, and that regulations could not be issued after November 1, 2008. Obama’s team has placed a similar level of emphasis on transition planning, something that the president has cited in the immediate aftermath of Trump’s victory, and at the meeting the two had at the White House on Thursday, November 10. Taking advantage of the 2004 Intelligence Reform and Terrorism Prevention Act, which states that presidential nominees may begin submitting names of personnel for national security clearance before election results have been determined, the Obama team, in the summer of 2008, began submitting names. Republican nominee Senator John McCain’s team submitted zero names, Kumar reports. Around the same time, in August of 2008, Rahm Emanuel was informally appointed as Chief of Staff. Working with John Podesta, Obama’s transition director, Emanuel established several agency review teams to evaluate the state of each agency, gather information, and recommend appointees. Emanuel also cooperated with the Bush transition team on the personnel process to expedite the hiring process for the White House staff. Podesta, as the founder of the Center for American Progress, was able to draw from a wealth of experts for transition help and resources. They formed a core part of the transition policy team that identified executive orders that would be less complicated to prepare and sign, such as removing restrictions around abortion and stem cell research. One of the pressing matters for Trump’s team is which Obama executive orders he wants to immediately undo, and which others of his own he may want to issue. Though Trump himself is unpredictable and there is little clarity about how he will approach the job, the country is in many ways in a more stable place today than it was eight years ago when Obama was succeeding George W. Bush. At the time, the U.S. was in the midst of two wars and a financial crisis -- coordination between the incoming and outgoing administrations was paramount. Obama is often commended for having met repeatedly with then Secretary of State Condoleezza Rice and Henry Paulson, Bush’s secretary of the Treasury. On issues such as the auto bailout and The Recovery Act, policy teams from both administration were influential in shaping the resulting stimulus package of 2009. Obama did not provide specifics, but he did reference the 2008 transition, saying he has instructed his team to emulate the “professional and gracious” approach taken by the Bush administration eight years ago. Fiscal conservatives warn of ballooning costs for existing social guarantees. But a thornier question confronts Democrats: Might they inadvertently worsen inequality, rather than close disparities between poor and well-heeled families? 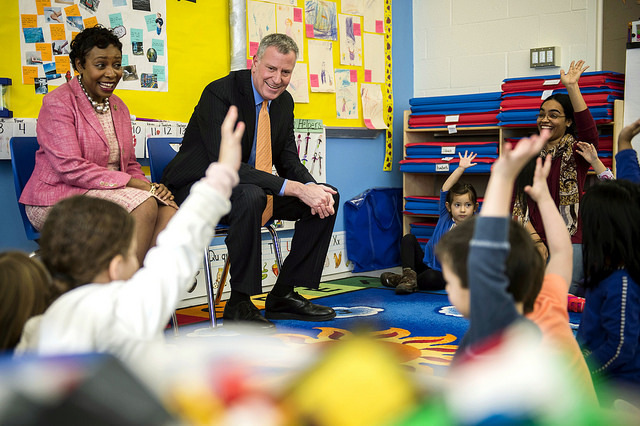 Take Mayor Bill de Blasio – poster boy for novel entitlements – and his well-meaning spread of free pre-K for all families, no matter how rich or poor. His original yarn was a tale of two disparate cities. "The best and the brightest are born in every neighborhood," he declared after winning election, seeking to narrow early gaps in children's learning. A half-century of research findings does show that quality preschool can lift impoverished children. But Mr. de Blasio pushed for a universal benefit, crawling out on a thin policy limb, ignoring three national studies, including my own with Stanford economist Susanna Loeb, that discern just minuscule and fading effects of pre-K for children from better-off families. Why? Because most middle-class parents – two-thirds of whom nationwide already enjoy access to pre-K – offer important nurturance at home as well. And if the mayor's pre-K proves to elevate all kids, how would this narrow gaps in children's early growth? The mayor's fuzzy logic reveals a deeper dilemma for Mrs. Clinton and Democratic candidates: How to rekindle opportunity for the middle class, while delivering on their perennial promise to lift the poor. White Americans have seen their earnings slip by 3 percent since the late 1990s, falling to $60,300 in mean wages last year. But total income ticked upward, thanks to middle-class tax cuts and rising aid for health care, says the Congressional Budget Office. In stark contrast, nearly 24 million children under age six live below or near the poverty line. Affordable pre-K remains out of reach for half these families. More than 103,000 four-year-olds populate New York City and are eligible for preschool. Mr. de Blasio has added more than 38,000 full-day pre-K seats citywide, totaling more than 68,500, many in depressed parts of the city. But over 30,000 potential preschoolers remain outside any public program, two-fifths being raised in the city's poorest neighborhoods. Entitlement hawks also teach us that one size can't fit all, especially when serving the nation's kaleidoscopic variety of families. At first Mr. de Blasio aimed to mainly enlarge the count of preschool seats in city schools, pleasing the teachers union but stirring protests from the city's 1,900 private, mostly nonprofit pre-K's, which have resisted cookie-cutter programs for over a century. Take parents who prefer half-day pre-K, allowing quality time at home for parent and child, but who now lose their subsidy, given the mayor's insistence on full days inside classrooms. Jewish educators seek more instructional time to advance religious teaching. 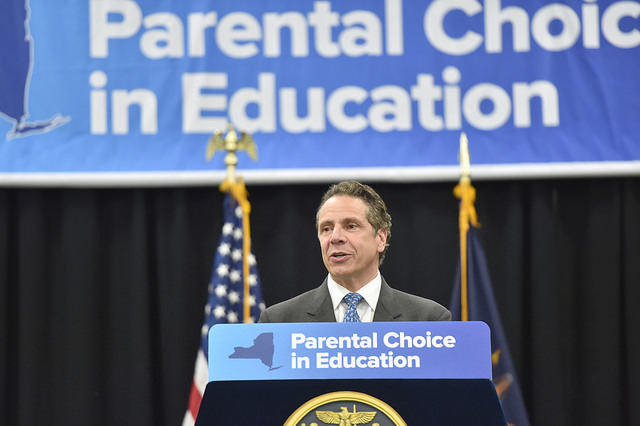 Charter schools last month appealed Albany's siding with the mayor that he, not charter authorizers, can regulate independent pre-K programs. 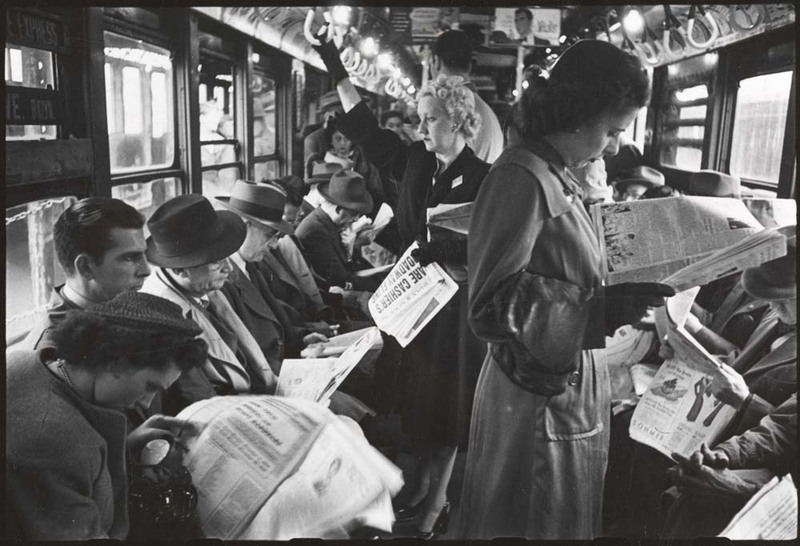 New York's experiment also reveals the risk of obsessing on what's new and shiny when regimented entitlements arrive. The mayor largely ignored existing supply, incenting middle-class parents to migrate into tuition-free preschools. This emptied up to 14,900 children from older programs, rather than widening access - what economists dub a substitution effect. "We lost two full classrooms of 4-year-olds," said Don Williams, manager of a Midtown pre-K.
President Obama and Republican governors, like Michigan's Rick Snyder, dodge the risks of unbridled entitlements, opting to expand pre-K access for poor youngsters, while easing middle-class costs via tax credits. 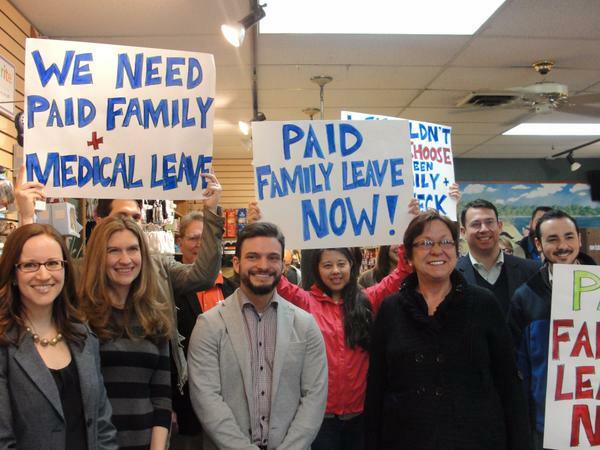 A rising count of companies, from Netflix to Goldman Sachs, help shoulder the burden of essential human supports: from paid leave for parents nurturing a newborn to insuring security in old age. Instead, untethered entitlements go awry when benefits tilt toward better-heeled players, say how price supports for farmers became welfare for the well-off, or when taxpayers underwrite pre-K or high-priced universities for parents who can afford to pay. The campaign season may prompt serious debate over the future of entitlements, along with how to bolster working families. But as Mrs. Clinton and leading Democrats embrace new social guarantees, pursuing middle-class voters, they should be honest about who they aim to buoy and who they would leave behind. Bruce Fuller, professor of education and public policy at Berkeley, is author of Organizing Locally (University of Chicago Press). 1. 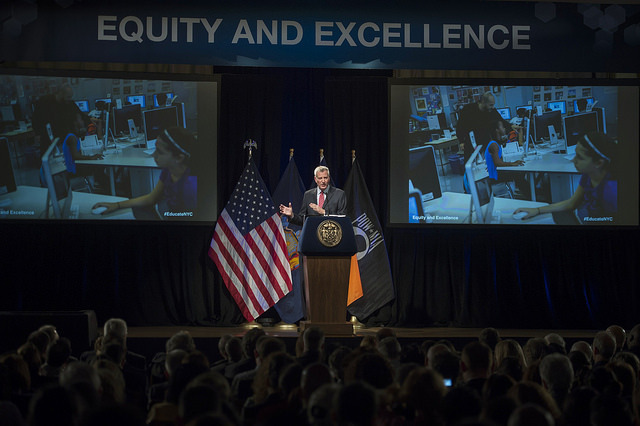 De Blasio Education Announcement: The mayor gave an "Equity and Excellence" education speech Wednesday, outlining a wide-ranging education policy plan that will commit about $186 million per year to enhance the performance and readiness of the city's students. Key elements include expanding computer science and advanced placement courses and adding reading specialists. The pieces will work in conjunction with previously announced de Blasio education initiatives including pre-kindergarten and community schools. 2. Cuomo Commits $ to Hudson Rail Tunnel: New York Governor Andrew Cuomo and New Jersey Governor Chris Christie sent a letter to President Obama offering to fund half of the Hudson River rail tunnel project if the federal government pledges to pay for the other half. The project could cost up to $20 billion and has been the source of tension between federal and local officials. 3. Crackdown on K2: On Wednesday, authorities announced that they had dismantled an international ring responsible for manufacturing and distributing synthetic marijuana, known as K2 or spice, which drug officials say has caused a public-health crisis. The mayor has designed a multi-agency strategy to combat the proliferation of K2 and several bills have been introduced into the City Council. 4. Papal Visit, UN General Assembly Create Security Challenge: Pope Francis' visit next week coincides with the annual U.N. General Assembly, which will bring 170 world leaders to the city, creating what Police Commissioner William Bratton called "the largest security challenge the department and this city have ever faced." 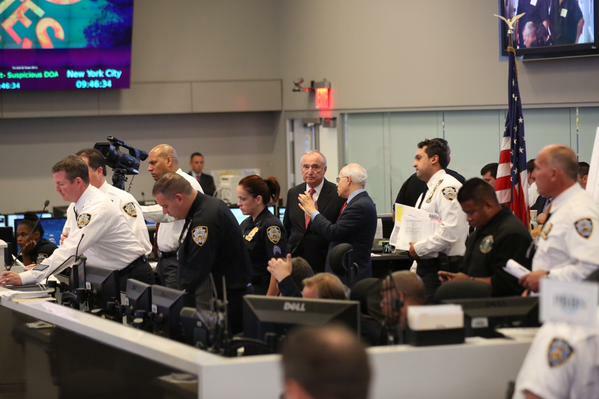 Federal and city agencies are preparing for the security and transit logistics. 5. Bharara Investigates Cuomo's Buffalo Billion: U.S. Attorney Preet Bharara is reportedly investigating Gov. Cuomo's controversial Buffalo Billion revitalization project, according to The New York Post. The investigation focuses on the multimillion-dollar contracts awarded to build facilities for high-tech, drug-development, and clean-energy businesses. $60 billion was spent on education in the 2013-14 school year in New York State, averaging $21,812 for each of the state’s 3 million students. Up to $20 million in federal funds will be given to New York City as part of a pilot program to decrease traffic injuries. As many as 10,000 vehicles will be fitted with smart devices designed to reduce traffic injuries, congestion, and pollution by 2017, and traffic lights will also be set up to beam information. 20.9% is New York City's poverty rate, according data released by the Census Bureau on Wednesday, meaning that the poverty rate has not lowered at all since last year. It was a good week for Columbia Law School Professor Tim Wu, who joined Attorney General Eric Schneiderman's office while he is on sabbatical. Wu, who coined the phrase "net neutrality," will serve as a senior lawyer and special adviser to Schneiderman focusing on technology and the law. Wu was a candidate for Lieutenant Governor in 2014. It was a bad week for former Assemblymember Bill Scarborough, a Democrat, who was sentenced to 13 months in prison and two years of supervised release after he pleaded guilty to state and federal corruption charges. Around this time 95 years ago, on September 16, 1920, Wall Street was hit by a bomb blast outside the headquarters of J.P. Morgan. The blast killed several dozen people and injured hundreds more. Authorities believed it was the work of anarchists, but the bombers were never found. Around this time 23 years ago, on September 16, 1992, thousands of off-duty police officers stormed City Hall to protest Mayor David Dinkins' support for an all-civilian police complaint review board. Around this time 4 years ago, on September 17, 2011, a demonstration calling itself "Occupy Wall Street" began in New York. Gotham Gazette's David King appeared on The Capitol Connection to discuss the latest with Governor Cuomo and more. 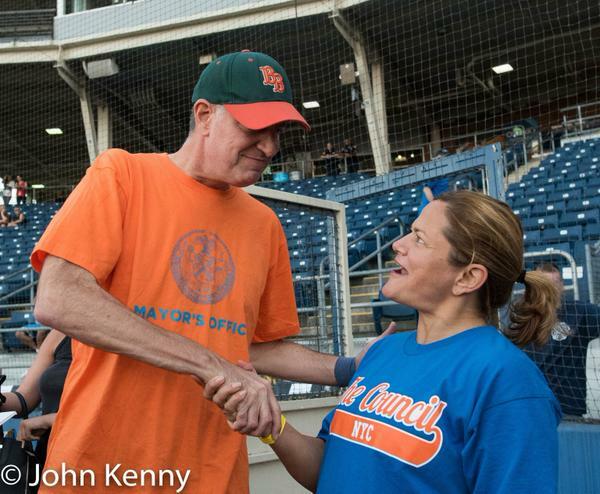 The Economist looks at how Mayor de Blasio is "doin'." New Quinnipiace poll results show how New Yorkers are feeling about their elected officials and more. NEW YORK - The 2013 New York City mayoral election’s record low 24 percent voter turnout rate is largely reflective of and dragged down by 11 percent youth voter participation. 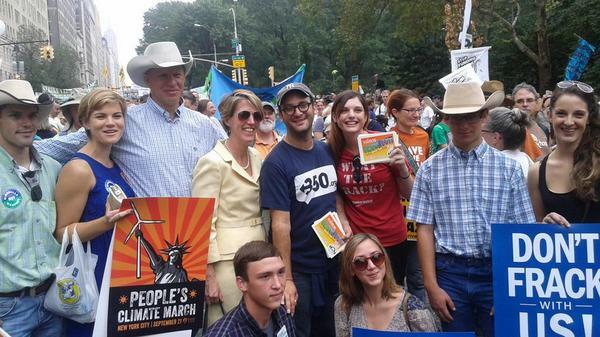 This especially paltry turnout among voters 18- to 29-years-old has spurred advocates and policy-makers to act. Friday saw the city’s first Student Voter Registration Day (SVRD), during which programming occurred in 25 schools across the five boroughs. 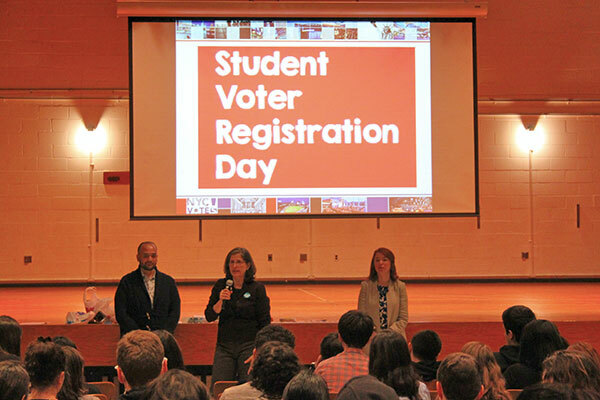 City Council members; representatives from NYC Votes, the voter engagement arm of the city’s Campaign Finance Board; and advocates led workshops at the schools during which they sought to connect students to local government and encourage them to register to vote. Rosenthal and those with her at Frank McCourt, which is one school located in the Brandeis High School Campus building, spoke to about 40 juniors during one class period and then about 100 seniors in another. She also spoke with students from two of the other schools in the Brandeis complex. When Rosenthal learned that 80,000 voter registration cards go out to high schools each year and very few get sent back, she says she started thinking about how more could be done to ensure that 18-year-olds know their rights and the value of voting. Rosenthal said that the Department of Education (DOE) would be the entity to really make SVRD a successful annual event in all high schools, but she is happy to lead the initiative and implement the pilot program. For the first SVRD, participants utilized a curriculum created by NYC Votes, which already leads other civic engagement workshops in city schools. If SVRD is to expand from the initial 25 schools to all of the hundreds of city high schools, NYC Votes will likely be integrally involved along with the DOE. It is not immediately clear how many registration forms were collected at Friday’s workshops, but Rosenthal said that she cannot wait to find out. Kaylah Bilal, a junior at one of the schools in Brandeis, had naturally never heard of the new SVRD, and she did not see a banner or poster in her school. Her enthusiasm was limited when she learned about it. “I’m just not into politics, the whole system,” said Bilal, who lives in Bronx. SVRD is aimed at helping students like Bilal connect their everyday lives to issues and to voting. During a 45-minute workshop, volunteer facilitators at each school gave presentations and asked questions following the standard curriculum specifically designed for SVRD. The brain behind the programming is Chyann Sapp of NYC Votes and the Campaign Finance Board. Her full-time job for the past four years has been increasing youth voter engagement and turnout in New York City, a post that exists in few other cities in the country. Sapp says that lack of education probably ranks higher than apathy as the top reason young voters are particularly inactive voters. Statistics show that eligible voters who do not cast ballots are mostly not registered to vote at all, and that being registered makes potential voters much more likely to go to the polls. There are, of course, other barriers people point to in explaining low voter turnout, and efforts are underway to improve access to absentee ballots, among other changes. The seminar style of SVRD is especially effective to educate students in comparison to simply handing out fliers and forms because students ask real-life questions face-to-face, Sapp says. She added that students “need to know why” voting matters, not just be given a piece of paper that allows them to register. Beth Newcomer from Rosenthal’s office assisted Murad Awawdeh and Betsy Plum from the New York Immigration Coalition in facilitating the two workshops with McCourt students. Awawdeh and Plum started by asking students to rate how much power they perceive having in their circles of family, friends, school, community, and government. Students largely explained that they perceived themselves to have much more power in their family and friends circles than in their government circle, in which some cited zero percent influence. Almost none of the students had heard of DACA, President Barack Obama’s immigration program that gives students who came to the U.S. as children protection from deportation and permission to work, though not the right to vote. Promoting awareness of DACA was a secondary aspect of the SVRD initiative. “If you have friends who are immigrants please spread the word and let them know” about DACA and access to the right to work, Plum told the students. Near the end of the presentation voter registration forms were passed out to students, along with stickers, bracelets, and candies. One student told her friend, “I’m a voter” after turning in her completed registration form. Micah Dicker, Drilona Bajrami, and Chelsea Solis, all graduating seniors at Frank McCourt High School, were among the few students in the workshop who knew of Rosenthal, the local city council member. The three teens were involved with participatory budgeting in the council district; Dicker and Bajrami interned for Rosenthal. Dicker and Solis mentioned that their families’ financial situations make them want to do more to change the political system. “I think a lot of people don’t vote because they just think of what happens now rather than what would happen in the future if you can’t pay for something or you can’t find a job,” said Solis.